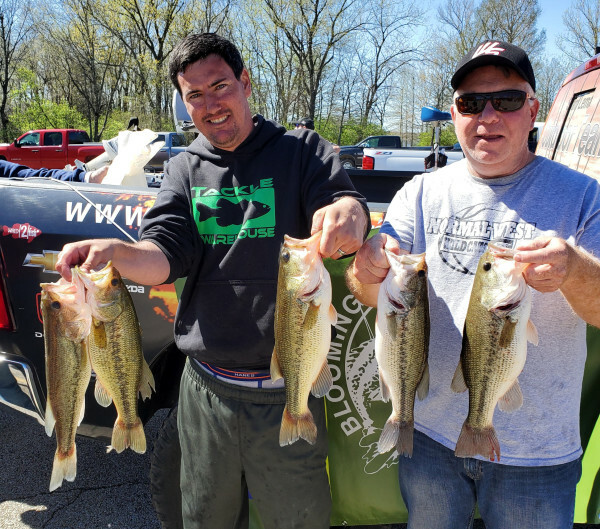 The BNBC Saturday Tournament schedule traveled to Sangcris Lake on 4-2-19. Teams found the conditions windy and cool for the start of the tournament with bluebird skies as well. 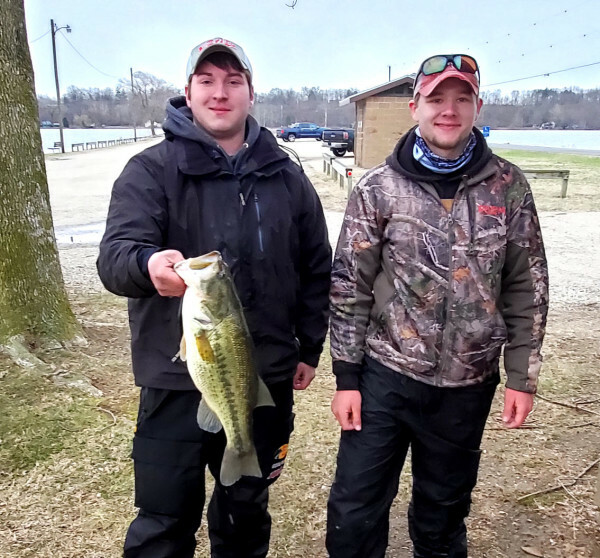 Teams reported fishing to be a little slow, and keepers very scarce in water temperatures form the mid 50′s to the low 60′s. 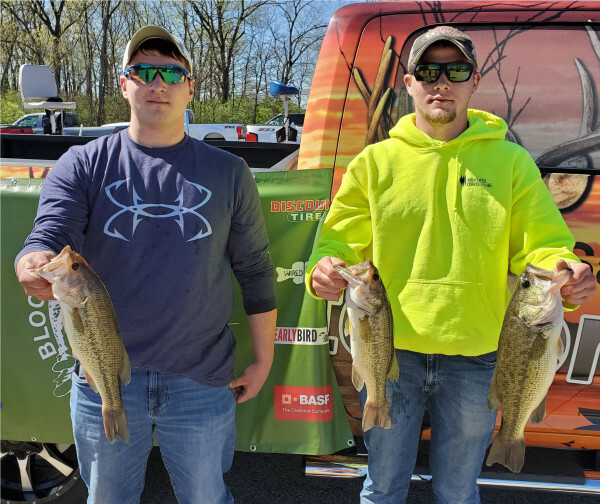 Teams reported catching good numbers of smaller bass during the tournament. However’; as usual someone finds the right formula to catch the bass and this tournament was no exception. Don’t forget to attend the next club meeting at Sam Lemans Toyota 5-1-19 at 7pm! We’ll be signing up teams for the 5-11-19 Spring Lake tourney. Well the BNBC Tuesday Night Tourney series is on a roll! 2nd Tourney of the year and weather was delightful and many teams appeared interested in getting their season off to a good start. 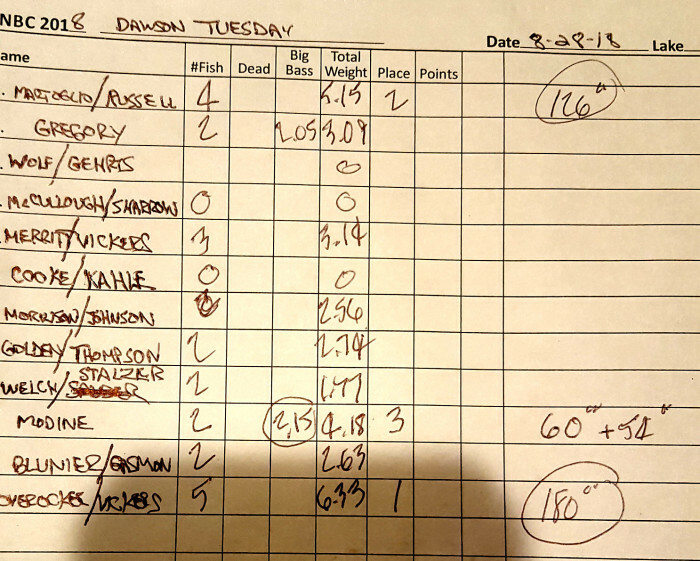 17 teams signed up to fish at Dawson Lake on 4-16-19 on a very pleasant evening. Unfortunately however 1 team experienced the dreaded issue with their boat not wanting to perform and so we had only 16 teams tackle the lake. Teams found the fishing much slower than had been experienced the previous week, maybe they were still getting over the recent snow storm? Regardless as is always the case some team is going to excel, and last night was no exception. 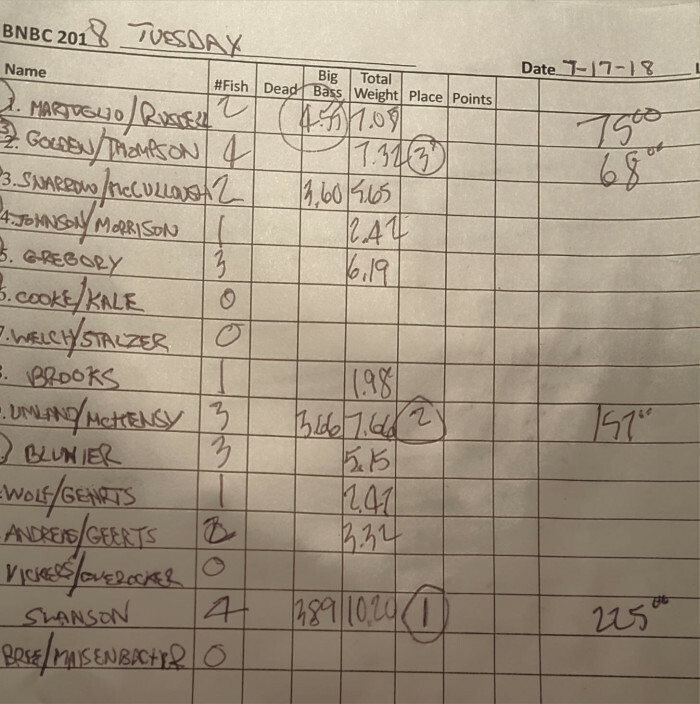 The team of Gregory and Gregory showed everyone how to do it with a nice limit of #7.36 edging out the weeks previous winner who had #7.10. Next week we will be at Lake Bloomington for our Tuesday Night tourney, hope to see everyone there again! Don’t forget on Saturday 4-20-19 the BNBC Saturday series at Sangcris East Ramp take off at 7am. Sign up at the ramp, weather looks pretty good c’mon down~! Reminder, if you have a friend that you wanted to get to join, now is the time, as through April if you renew or sign up with a new member that wasn’t a member last year you can join for 1 price for both memberships! 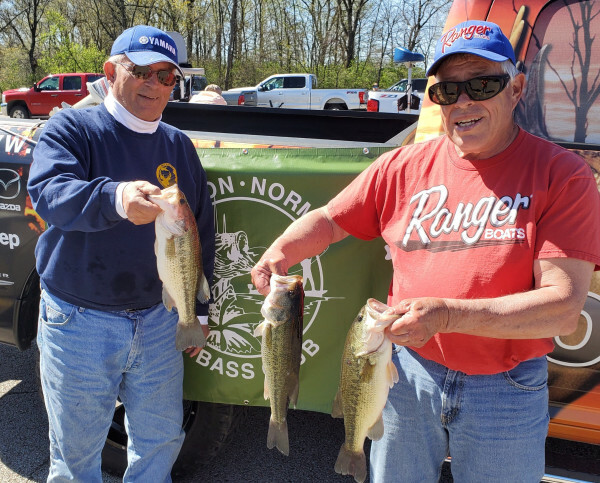 The 2019 Tuesday Night Tournament series kicked off on Dawson Lake on 4-8-19 on a beautiful evening with mild temperatures and gentle breezes. Many teams must have been champing at the bit to begin the season as we had a very good turn out of 14 teams! Teams found the water temps in the high 50′s and lower 60′s, with clarity very good and conducive to the visibility of their presentations. Fish was fair and there were a good number of teams weighing in bags of fish, larger fish were rare however, but good fish were weighed in, and I believe everyone enjoyed the event as it was a departure from the desire to actually get out and go fishing. Well, great start to the season and hope it continues with good weather going forward! Next week we are ack on Dawson for round 2, 5:30 take off see you there! Don’t forget if you are interested in fishing these tourneys or the Saturday tourneys, if you sign up with a friend during the month of April and you or your friend weren’t a member last year you can join both for 1 price for the year so come on out. Also remember the Saturday tourney on Sangcris on the 20th from the east ramp take off at 7am, sign up and join at the ramp! 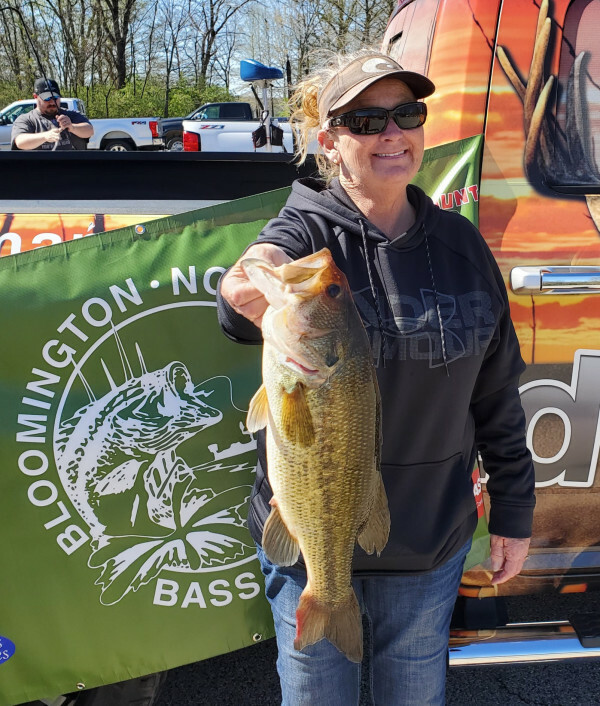 The BNBC 2019 schedule opened Saturday 3-30-19 on Spring Lake under cool, windy, and threatening skies. Water temps ran in the low to mid 50′s and water clarity was clear as well. 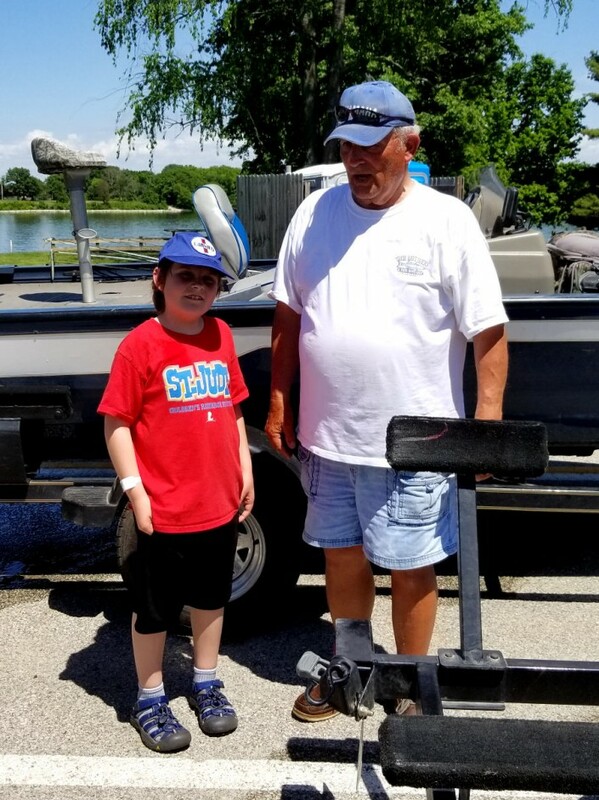 Fish were caught, however; keeper size fish over 18″ were rare, but someone always catches fish, and Spring Lake was no exception. 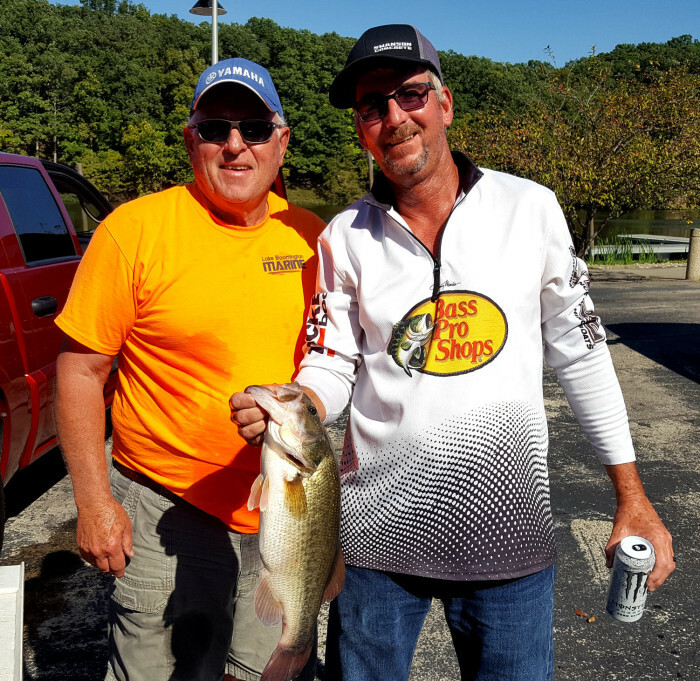 Attached phot0 of Big Bass of #4.75 caught by team of Golden/Carson.One of our sponsors Sam Leman’s truck was at the tourney with our club banner displayed on the side. 2nd Place Golden/Carson-1 fish @4.75 and big bass. Hope to see all at the next meeting on 4-3-19 at 7pm at Sam Lemans Toyota, Mike Garthouse local fisheries biologist will speak to the club. The BNBC Saturday Classic tournament was held on New Lake Gillespie on 10-13-18, 10-14-18, 6 teams that had qualified participated in the tournament. Leaving from various central Illinois locations teams were surprised, I think, to have it start snowing on Friday as they left for Litchfield! Colder temperatures and rain were the weather as they arrived in Litchfield prior to day 1. Saturday presented a starting temperature of 38 degrees with a brisk wind as they launched for the tourney. New Lake Gillespie has a slot of no fish between 12″ and 15″ are to be kept. Water temps were in the mid to upper 60′s at take off. 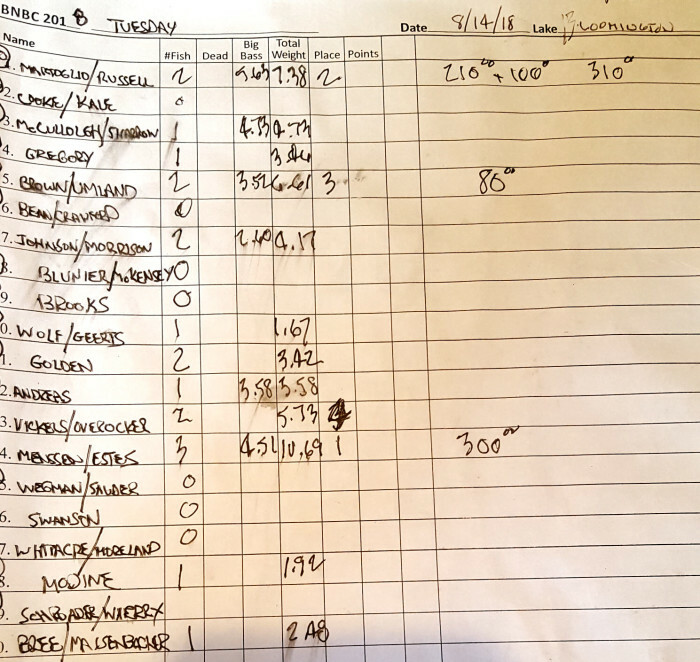 Fishermen reported mixed success with the fishing but as always someone figures it out, and this day was no exception. 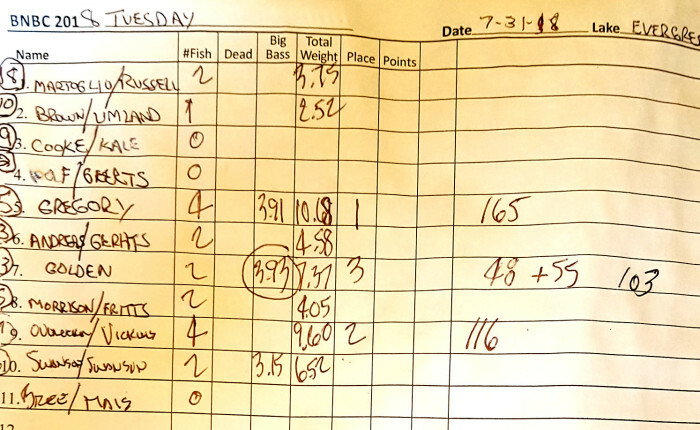 The team of Johnson/Somodi brought in 5 fish limit of 11.86 to take over the lead in the tournament. They were followed with 2nd Place team of Martoglio/Russell-#6.04, and 3rd Place team of Merritt/Walker-#4.68. 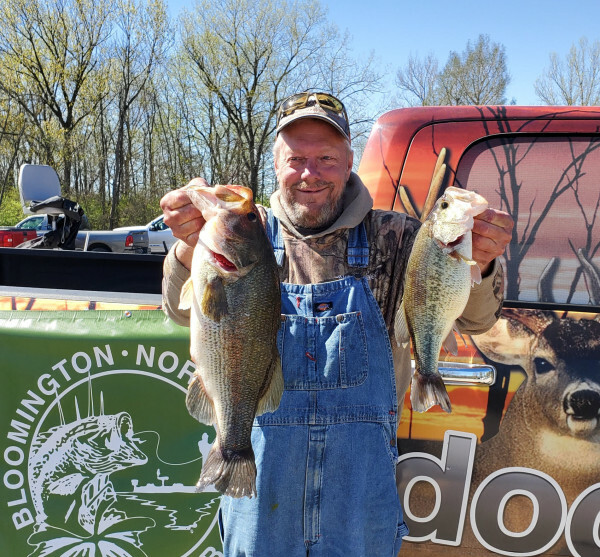 Day 2 was somewhat warmer but had a threat of rain, teams found fishing a bit slower for the day, but again someone always seems to figure it out, and this was the case here as well. 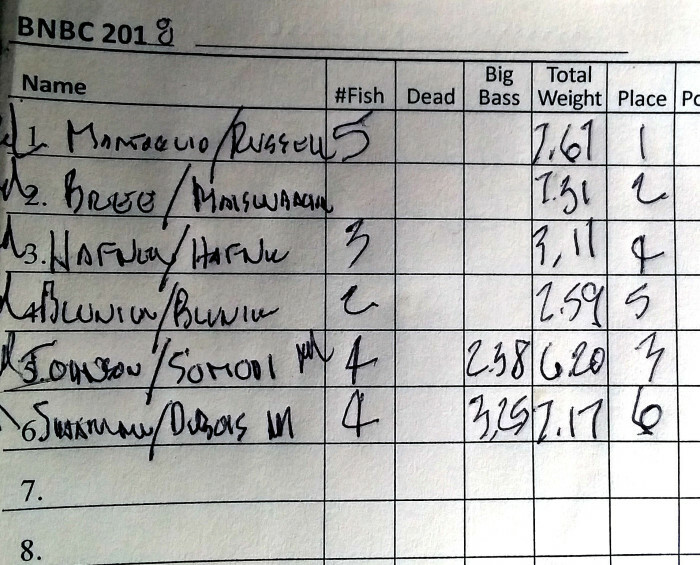 The team of Martoglio/Russell brought in the only 5 fish limit of #12.21, bringing their total for the tournament to #18.25. 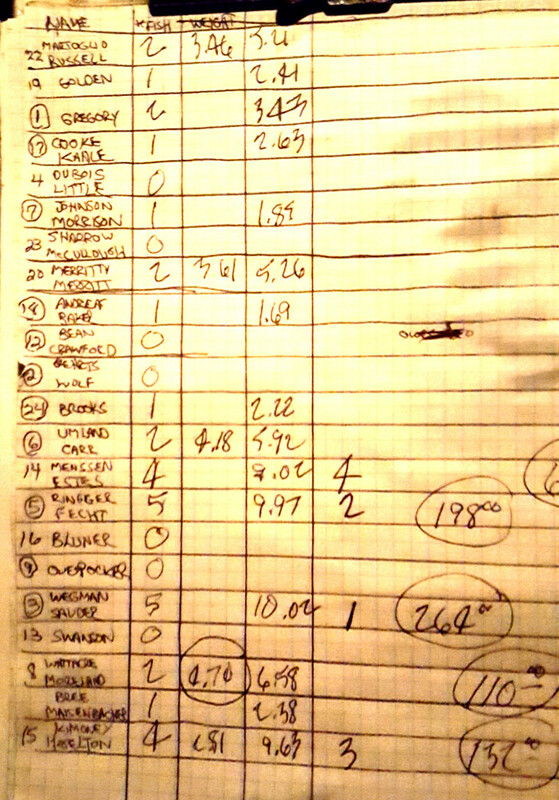 The day 1 leaders Johnson/Somodi stumbled with no fish, but held on to 2nd place with #11.86. The 3rd place team of Merritt/Walker finished with #9.10. I personally had a great time at the classic and already looking forward to next year! Hope to see all at the Awards Banquet at Bandanas at 6pm on 10-27-18! The BNBC Tuesday Night Classic tournament was held on Lake Stephen Forbes on 9-29-18, 9-30-18, 11 teams participated. This lake hasn’t been visited by the BNBC for a few years due to the implementation of a slot limit of must release fish from 14″ ~ 18″. The thought process was that this regulation had been in place for 4 years and larger fish would be more accessible and likely due to the allowance to grow without harvesting. 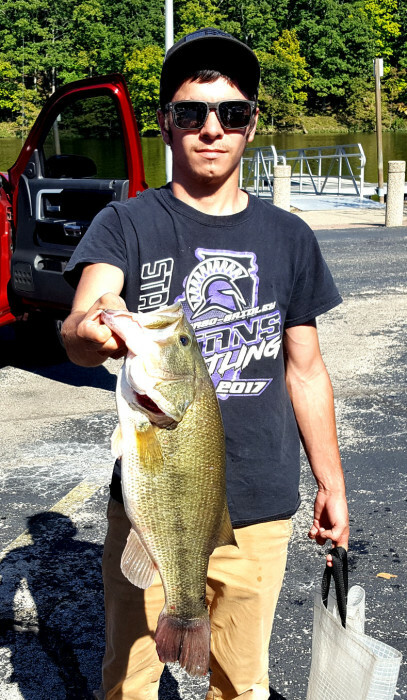 The results of the BNBC tourney didn’t support that assumption, as teams found catching a fish over the 18″ slot to be somewhat difficult! Teams also found catching fish in the 12″ ~14″ range to be somewhat difficult as well. 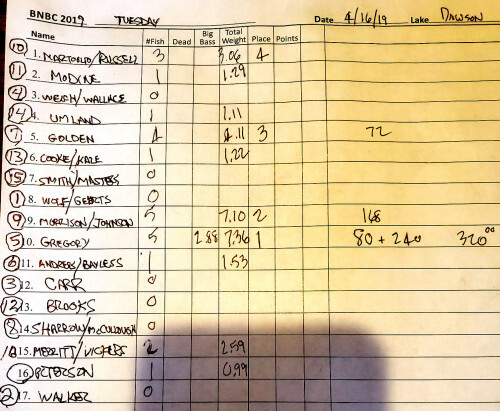 This may have been a result of the impact of the pretty severe cold front that occurred on Friday, as well as DNR shocking on Thursday prior to the tourney. Regardless fishing was spotty for the teams, however; someone always figures it out and this tourney was no exception. 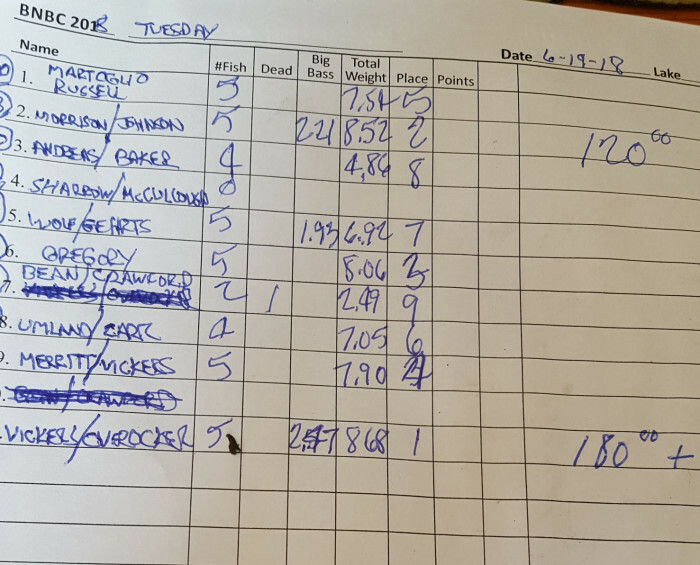 The team of Overocker/Vickers again showed their prowess on the lake, as they had won the last classic held here, with a bag of #14.43 on the opening day. 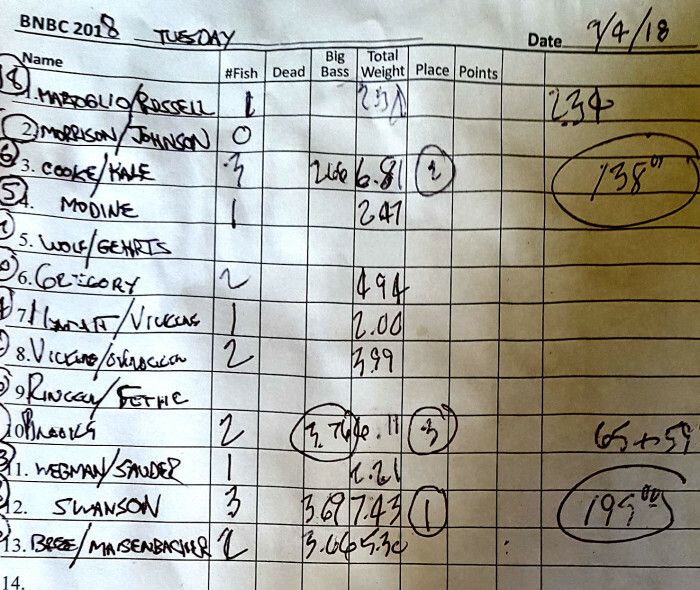 This limit put them in a commanding position, as the next closest team weighed in #7.89. Day 2 was a beautiful day with warmer temps and reduced winds, but the fish didn’t seem to cooperate on this day as well. 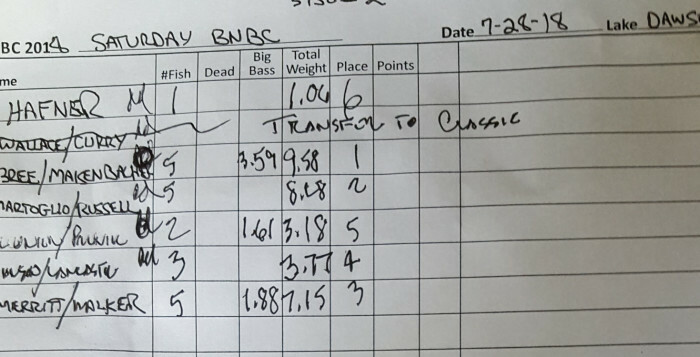 The 1st place team weighed 1 fish #1.25 and the 2nd place team also weighed in 1 fish #1.36, which changed the leader board a bit. I hope everyone had a good time, I know that Martoglio/Russell certainly did and really were happy to see a great turn out for the fall classic. We are already looking forward to next year and what it will bring, don’t forget meeting on Wednesday 10-3-18 at Sam Lemans upstairs in the training room, hope to see people there! The Saturday Classic is scheduled for 10-13,14 so don’t forget to let us know if people who qualified are coming to New Lake Gillespie near Litchfield! Gregory/Gregory. Congratulations on fine season! It was a great season and I believe most had a good time, hope most teams that qualified sign up for the classic at Stephen Forbes lake near Salem! 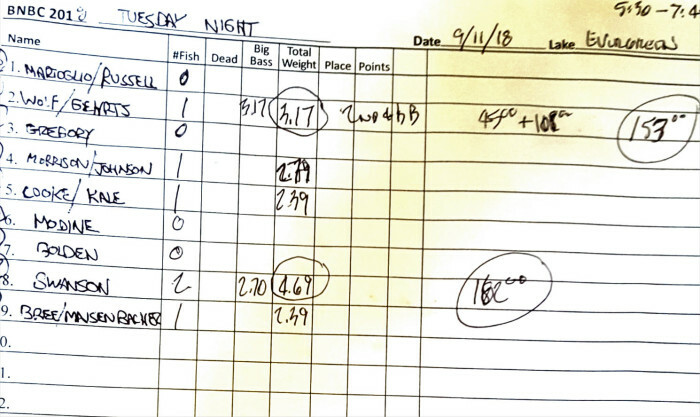 The BNBC Tuesday Night Tournament schedule took us to Lake Bloomington on Tuesday 9-4-18. 13 teams signed up to fish on a very warm and breezy evening. 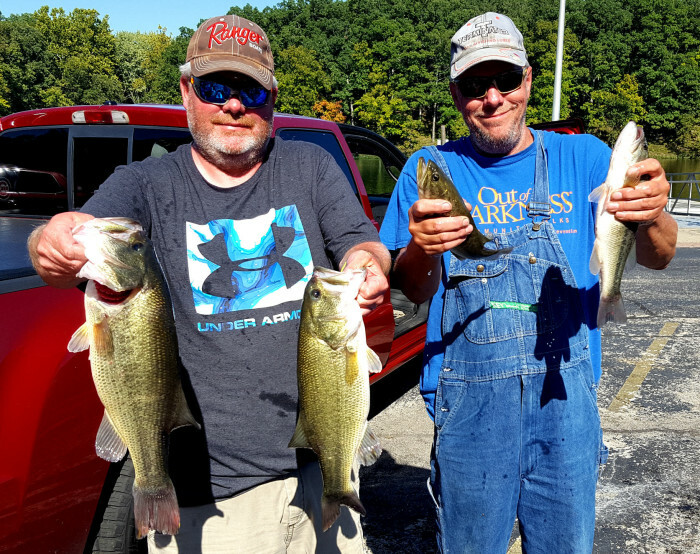 Shorter fishing times, and a slow bite seemed to affect the results for the teams. Next weeks tournament will close the 2018 Tuesday tournament, has been a fun season. The BNBC Tuesday Night Tournament series continued on Dawson Lake on Tuesday 8-28-18. 12 teams fished on a hot, humid breezy evening on Dawson Lake. 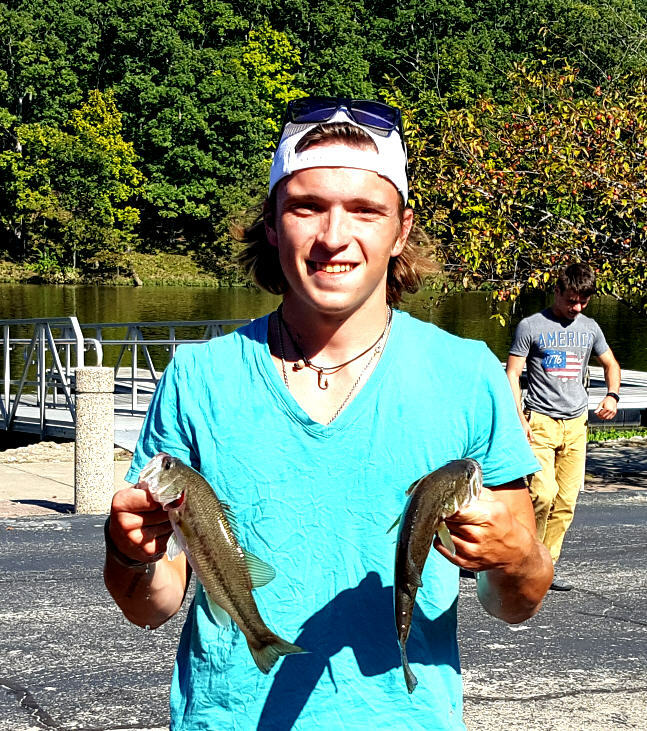 Fishing was tougher than usual, and over 15″ fish were hard to find for most teams. 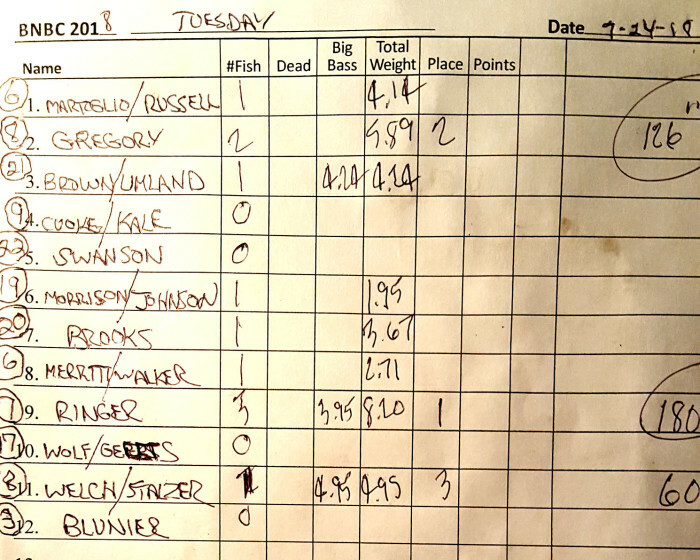 However, someone always finds the answer and this night was no different with 1 team having a 5 fish limit. Season winding down, next week at Lake Bloomington, hope to see everyone there! 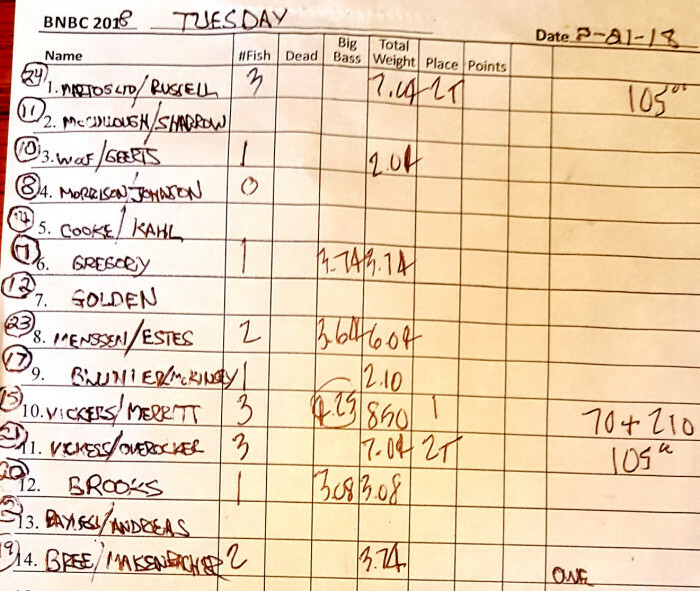 The BNBC Tuesday Night Tournament series schedule took us to Evergreen Lake on 8-21-18. 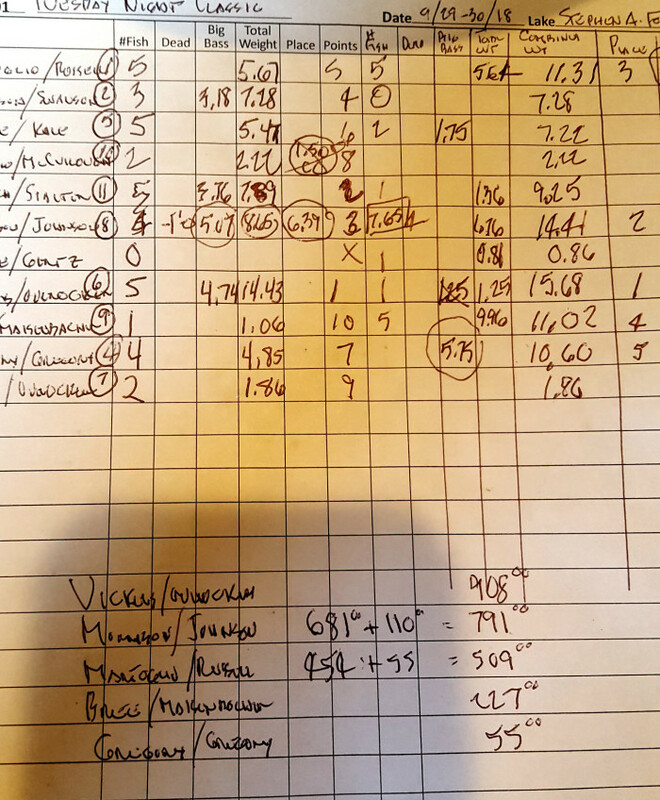 14 teams found much lower water conditions than was on our last visit. Fishing was spotty, possibly due in part to a shorter fishing time due to shorter days. Team of the year race heating up! Classic berths need to be filled in and time is running out, so come join in for the last few tournaments of the year! The BNBC weekend tournament series continued on Dawson Lake replacing the Havana event on the schedule. Again this year water levels created an unacceptable condition for the bass club to hold an event there this year. Saturday 8-18-18 the conditions were cool and foggy for the contestants on Dawson Lake. Fishing was spotty and limits were not plentiful, but good fish were caught. The BNBC Tuesday Night Tournament series schedule took us to Lake Bloomington on Tuesday 8-14-18. A large turn out of teams, 20, found keepers elusive. Quantity was missing, however; quality was not with several #3+ fish weighed in. Hope big turnout at next tourney as we’ll! Don’t forget the BNBC tournament for Illinois River Havana is moved to Dawson Lake this Saturday starting at 6am. The BNBC Tuesday Night tournament series continued at Evergreen Lake on 7-31-18 on a dark and threatening sky. Still 11 teams braved the potentially unstable weather conditions and signed up to catch the most fish. Weather turned out to be a non factor as it cleared up and was a very pleasant evening. 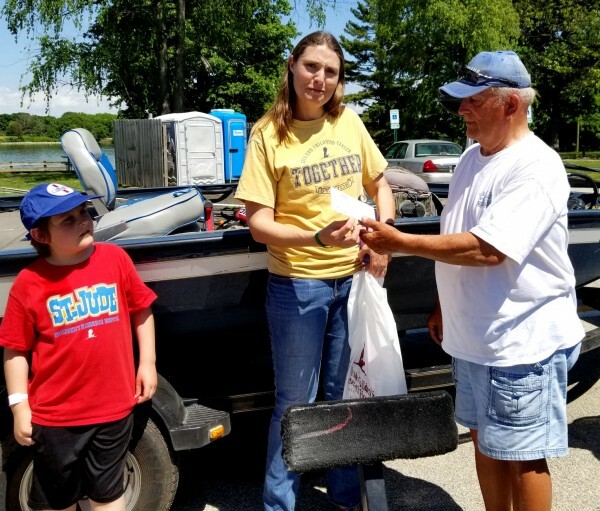 Teams found various fishing conditions and brought in decent bags to win the tournament. Next on the schedule is the Watermelon Open BNBC regular meeting at Miller Park tonight at 6;30pm. Next BNBC Tuesday Night tournament is at Clinton Lake West Access on 8-7-18, at 5:30pm, hope to see all there! The BNBC Weekend tournament series visited Dawson Lake in Moraine View State Park on Saturday 7-28-18. The fisherman found cooler temps and clear skies to begin the tournament and fishing generally tough. Fish were caught on frogs, and senkos, plastic drop baits, and scattered fish. Next BNBC tourney is at Havana on 8-18-18, and next meeting is Wednesday 8-1-18 at Miller Park for the Watermelon Open so make plans to attend! 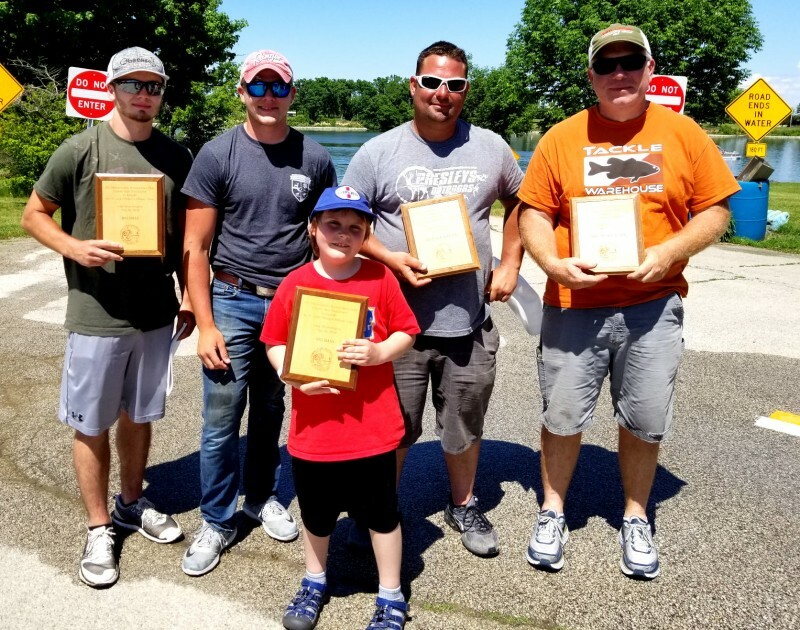 The BNBC Tuesday Night Tournament series continued on Clinton Lake on 7-24-18. 12 teams participated on a warm breezy evening of fishing. All teams found fishing difficult for the bass, however, someone always finds a way! This night it was a Ringer, that found the key and capitalized on it to win! Join the fun next week on Evergreen Lake, hope to see everyone there! 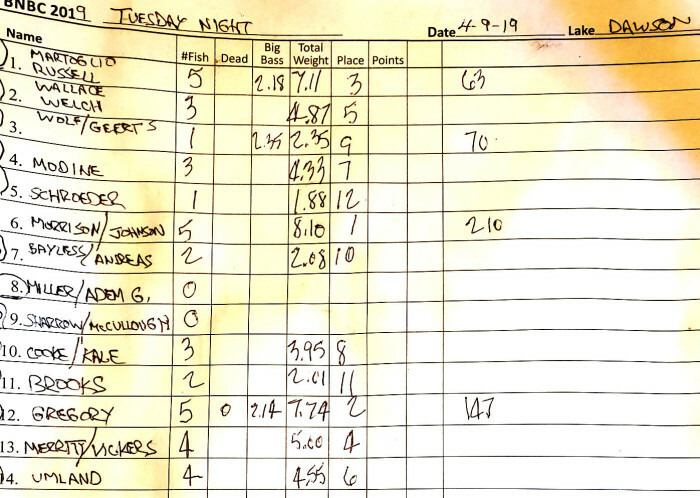 The BNBC Tuesday Night Tournament Series continued the schedule at Lake Bloomington on 7-17-18. 15 teams joined in an effort to catch the most fish in the tournament. While fishing was not great, still enough fish were caught in the tournament to make it interesting. 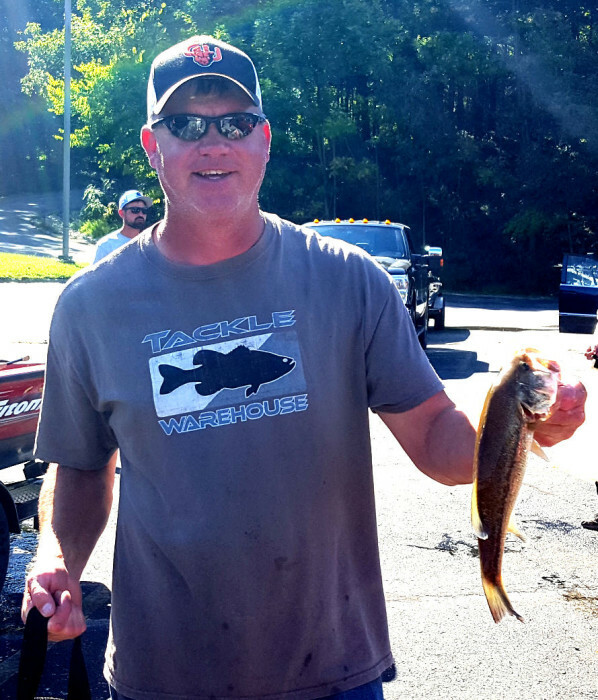 Some nice small mouth fish were caught in the tournament as well. The BNBC Tuesday Night Tournament series will be at Clinton Lake on 7-24-18, hope to see you there! The BNBC Tuesday Night Tournament series continued on Dawson Lake at Morraine View state park on Tuesday 6-19-18. 10 hardy teams participated in the tournament despite threatening weather forecasts in the area. Teams experienced a little period of concern with the weather when a thunderstorm burst on them for a brief period of time. Some teams appeared to forget their rain gear and took shelter near the snack bar! Good weights were again the norm for the tournament as fishing was very entertaining for the participants. The series continues next week at Evergreen Lake, so hope to see everyone there! 22 teams showed up at Lake Bloomington last night for the Tuesday Night Tournament. A variety of results showed the lake was apparently over the spawn as better quality fish were seen. Good bags were brought in, and a fair number of teams weighed in fish. As always some teams excelled, and last night was no exception.